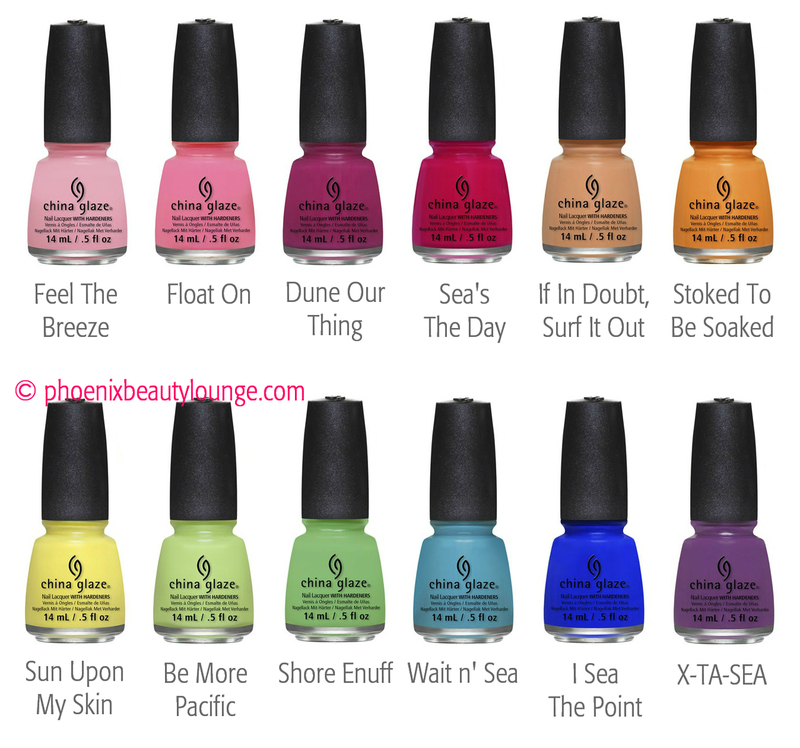 China Glaze Off Shore Summer 2014 Collection Available! Sun kissed days and electric nights … filled with friends, fun and water!!! Grab your board and meet us in the water. 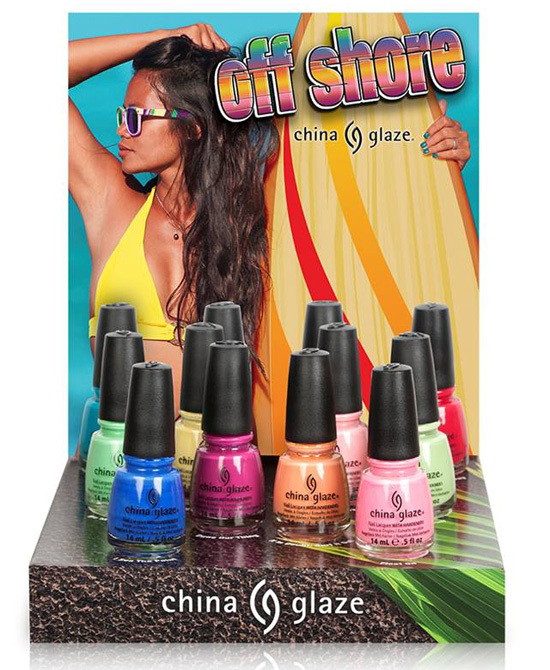 That’s the inspiration for the China Glaze Off Shore Summer 2014 Collection. Playful and sunny, enjoy these creamy brights. Reviewed as having the best creme formula from China Glaze so far, these shades go on smoothly, sometimes covering in one coat! Surprise yourself and make a splash this summer. This soft peachy orange creme-sicle looks delicious! This bold tangerine orange creme is better than an Instagram filter. This sassy tomato red creme screams look at me! This raspberry maroon creme is still visible while zooming around on dune buggies. This mystical eggplant purple creme has got your back. This royal blue creme has a hint of purple, but it’s bluer than the sea. We can’t wait to see this blue leaning teal creme, because we hear it’s nearly jelly. This bright leafy green creme will be everyone’s envy. This soft apple green creme is pretty juicy. This light custard yellow creme is hot like sand in the sun. This pale princess pink creme is cute like a fluffy unicorn marshmallow. This hot dolly pink creme is soft like the swinging of a hammock. 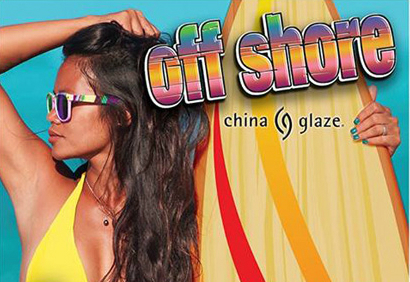 China Glaze Off Shore Summer 2014 Collection is now available in store and online at Phoenix Beauty Lounge. What do you think of this very creamy summer collection? Which shades would you like to try first? Let us know in the comments! This entry was posted in Collection previews, Colors, Press Release and tagged buy china glaze online, buy nail polish online, china glaze, china glaze neon, nail polish, neon, neon nail polish, neon nails, new collection, summer 2014, www.phoenixbeautylounge.com by phoenixbeautylounge. Bookmark the permalink.